The sudden heat wave continued last night. It was approaching 90F when we got home from work yesterday, so we delayed Freyja’s usual after-work walk until later in the evening, bleeding off some of her energy with a play session in the backyard instead. (She caught her very first mid-air frisbee!). After a movie to pass the time—and some Greek yogurt and rather bland California cherries to snack on—we took her on her walk; by the time we got back, it was dusky outside and nearly 9pm. Since the house had also cooled down a touch, I headed into the kitchen to make us a late dinner. The plan: Wild salmon fillets with a roasted red pepper sauce and sides of sauteed snow peas and quinoa pilaf. I got two red bell peppers anointed with oil and slipped under the broiler, and set about making some cookie dough to chill in the refrigerator (more about that tomorrow) and fighting off the piles of dishes that were threatening to take over the kitchen. The peppers took so long to char that I made a huge dent in cleaning up the kitchen; I am beginning to wonder if the oven broiler isn’t working properly. Once the peppers were (finally) done, rested and peeled, I got dinner on the table in probably less than 20 minutes. The sauce—I used the recipe here—was very simple to make, though I was still working on dishes and managed to mess up the order of operations. It was none the worse for wear, however, and turned into a gorgeous, bright, thick, and very flavorful sauce. I did the salmon fillets broiled skin side up a la Ming Tsai, my favorite technique for salmon since making his miso-citrus salmon. I just rubbed both sides with salt and pepper, put them skin side up on an oiled roasting pan, drizzled with some olive oil, and broiled them for about 8 minutes. We aren’t fans of medium-cooked salmon, even though Jeremy likes it raw as sushi, so we always let ours go just until it flakes. With this method, the skin protects the fish from drying out. When the salmon was done, I let it rest for a few minutes, keeping the sauce on low heat, and sauteed some fresh snow peas from the farmer’s market. My basic method is as follows: Heat some olive oil, and briefly saute some minced garlic over medium heat until it becomes fragrant. Add a pint of fresh trimmed and rinsed snow peas, and toss to coat, then add about 1/4 C water, cover, and allow to steam for a minute or two, until they turn bright green. (I plated my salmon and sauce while I waited.) Then uncover, push the heat to medium high, and evaporate the water, tossing the snow peas to keep them from overcooking. Season to taste with kosher salt and fresh ground pepper, and serve immediately. By the time we ate, it must have been after 10pm. But it was a wonderful dinner. The salmon was very meaty and flavorful, and stood up to the roasted peppers nicely. 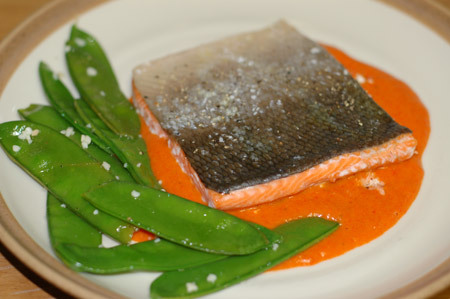 The snow peas tasted very green and fresh, and their brilliant color set off the salmon and its background of red sauce perfectly. I didn’t get around to making the quinoa (and didn’t have the heart to get another burner going in our warm house), but it wasn’t necessary. And now I get to figure out what to do with a leftover piece of salmon and a cup or so of pepper sauce. Lucky me!